SEATTLE (AP) — Helicopters and trucks are relocating hundreds of mountain goats from Olympic National Park in an effort officials said will protect natural resources, reduce visitor safety issues and boost native goat populations elsewhere in Washington state. Professional crews used tranquilizer darts and net guns to capture the animals from rocky ridges and slopes within the national park, located about 100 miles (160 kilometers) west of Seattle. The animals were blindfolded, put into specially made slings and airlifted to a staging area in the park. They were examined, collared with a tracking device, given fluids and then began a journey by truck and ferry to another area in the North Cascades. From there, they were flown in crates and released into alpine habitat. A plan approved by park officials in June calls for about 375 goats to be moved to habitat in the North Cascades, where the animals are native. Park officials estimate between 275 and 325 goats that can’t be caught will eventually be shot and killed. Introduced to the area nearly a century ago, before the park was established, goats eat and trample sensitive vegetation, disturb soil when they wallow and can be menacing to backpackers and other visitors on trails, officials said. In 2010, an aggressive goat fatally charged at a hiker on a popular trail who followed him and his companions, renewing concerns about safety. 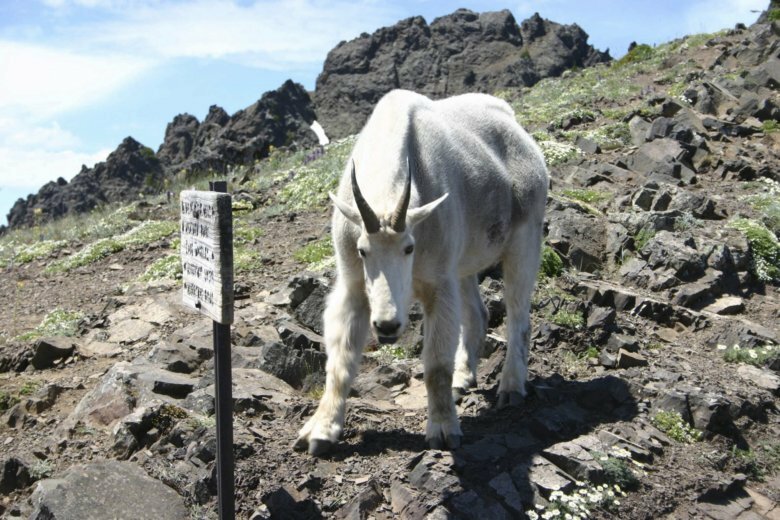 The “effort will relieve issues with non-native mountain goats in the Olympics while bolstering depleted herds in the northern Cascades,” Olympic National Park Superintendent Sarah Creachbaum said in a statement. Officials have tried for decades to control goats in the park. They removed hundreds of the animals by helicopter in the 1980s. It proposed shooting hundreds from a helicopter in the 1990s but that idea was scrapped. They also experimented with sterilizing some animals to control the population. Between 2004 and 2016, the goat population in the park more than doubled to 625. There are now about 725 animals. Goats can be a nuisance along heavily used trails and around wilderness campsites because they seek out salt and minerals from human urine, backpacks and sweat on clothing, according to officials. Penny Wagner, a park spokeswoman, said the goal is to relocate 100 by Sept. 24. The hope is that between now and next year, they’ll be able to relocate several hundred more goats, she said. Rachel Bjork, a board member with Northwest Animal Rights Network, called the plan to kill hundreds of goats inhumane. She said the goats have been a part of the national park landscape for decades and likely provide benefits to the ecosystem that are being overlooked. She also worried about moving them to forests where they eventually could be subject to hunting. But Rachel Blomker, a spokeswoman with the Washington Department of Fish and Wildlife, said that while that could be the case, goat hunting is very limited, the season is short and requires a special permit. Blomker said the agency’s goal is to help boost the number of goats in the North Cascades to a sustainable population. “That’s where they should be. That’s their native habitat,” Blomker said.